Alfred Deakin was Australia's second Prime Minister (1903-4) and a founding father of Federation in Australia (with Edmund Barton). He also served as PM for two subsequent terms, 1905-8 and 1909-10. Leonie Loveday reviews the latest biography of Deakin, The Enigmatic Mr Deakin by Judith Brett (Text Publishing, Melbourne, 2017, ISBN 9781925603712 Pbk). 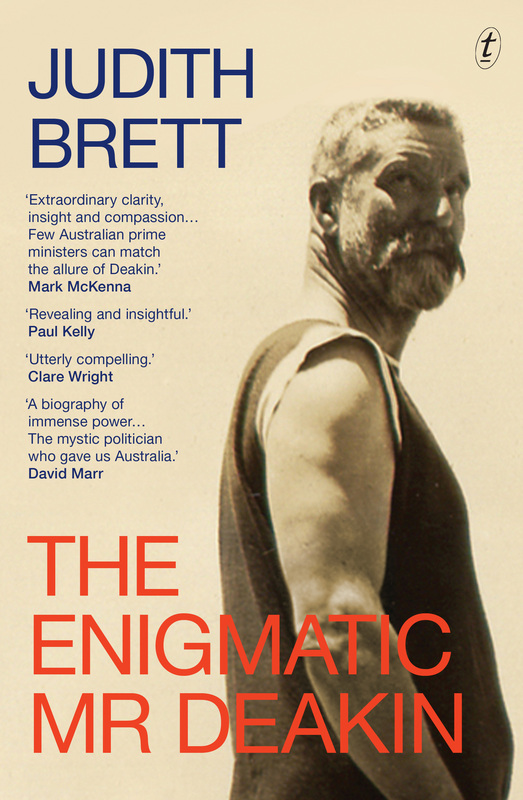 Brett’s latest work The Enigmatic Mr Deakin has been critically acclaimed particularly by her peer - Professor Mark McKenna in The Monthly (Sept. 2017) described it as 'the fifth and best biography on Deakin to date'. Brett is a professional historian and author of previous works on Australian politics, notably Robert Menzies’ Forgotten People (1992) and Australian Liberals and the Moral Middle Class (2003). This is not a stodgy historical treatise written in inaccessible academic prose. Brett provides the reader with a compelling and engaging book on the life and times of Alfred Deakin. But it is more than that because she skillfully weaves the family story of the Deakin and Browne families into the period of Australian political history that has most influenced the way we live today. She doesn’t miss a trick when she opens her introduction, placing Alfred Deakin’s birth two years after that of Ned Kelly in the 'colony of Victoria'. But we learn that the comparison stops there because 'Deakin was the only son of respectable goldrush immigrants'. Deakin entered the Victorian parliament in 1879 at age 23 and was a popular politician. He was an active and sometimes controversial member because he was reluctant to be influenced by the powerful and landed members in the Upper House. However, when it came to issues relating to the local aboriginal peoples, he was 'not unsympathetic' but Brett adds succinctly, 'he was not a fighter, and he had no emotional capacity for lost causes, not matter how just'. Candidly damning indeed. Even though I have not yet tried the software, I found this book to be easy to follow. While clearly a fan and heavy user of the software, the author explains a few limitations, and is fair in assessing the features. One criticism I have is that the author doesn't mention how this might, or might not connect with the use of traditional family history software.